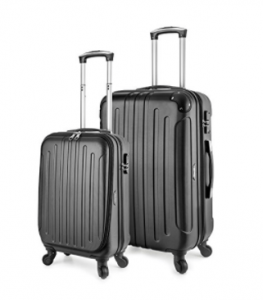 TravelCross Victoria is a 2018 model hot new release hardshell yet lightweight, functional, reliable and comfortable two-piece luggage set with 360-degree rotating solid spinner wheels and a great performance for your business trips and holidays. Being a very new release product there are only a couple of reviews so far and is rated 4.5/5 stars at the time of our review. You can either get the 20-inch carry-on cabin bag on its own or pay about 45 dollars extra and get the 28-inch size large suitcase as well. You have six great colours to choose from, black, purple, dark blue, silver, red, and champagne. The bags look cool whichever colour you choose and with their unique design, it will be easy to spot them in a crowd of suitcases at the airport carousel. The combination code lock on them is TSA- approved to give you a sense of security and peace of mind. And the TSA staff can access them easily without breaking the lock. You’ll find a convenient compartment on the small 20” cabin bag that is easy to access and you can put your laptop or tablet in it. The hardshell material is resistant to impact, wear and tear and is made of solid ABS plastic that is also lightweight which will help you not go over the weight restrictions by the airlines. The spinner wheels roll in every direction smoothly and quietly, giving you easy mobility. They have the very solid and resistant aluminium trolley handles with an ergonomic design. And you’ll get through the parking grounds and airport terminals quickly. 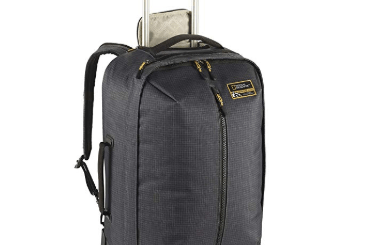 The little cabin bag weighs 6.5 pounds and measures 20 x 14 x 8 inches and the large 28-inch suitcase weighs 9.8 pounds with the dimensions of 28 x 19 x 12 inches without the wheels or the handles. The smaller 20-inch bag is good for being taken on the plane as cabin luggage and will fit in the overhead locker above you. 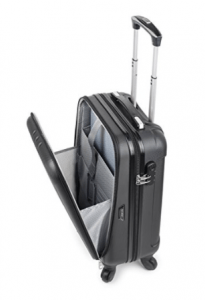 The large 28-inch suitcase can be expanded but not the 20” carry-on which has the convenient laptop compartment at the front instead. It is easy to reset the combo lock as you just keep it at its original 0-0-0 and press the little round button to reset with a pen, hear a click sound and set your three digits that you’ll remember easily and press the tab on the side. The Victoria Luggage Set offers you a good combination of a sleek and modern design, good build quality and functionality. It is very good value for money.